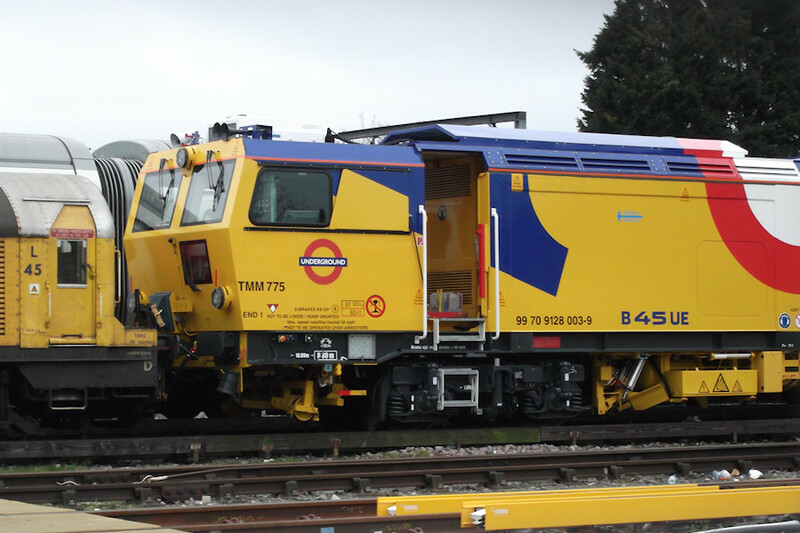 Details: London Underground's fleet of track tampers was renewed at the end of 2015 with the delivery of two Matisa B45UE machines ordered in 2013. Both were in use at Barking on 26th March 2016 and this photo shows TMM775 coupled to battery loco L45. As will be apparent, the new machines are not to tube profile and hence can only be used on sub-surface and surface lines. The livery retains the use of yellow traditional for track maintenance machines but adds blue sections and a huge roundel. Note that the cab side windows are provided with sliding covers. Also visible is the EVN (European Vehicle Number) of 99 70 9128 003-9, this being a requirement for all such vehicles that will run on Network Rail tracks.